1. Preheat the oven 200°C, gas mark 6. Place 2 flat baking sheets in the oven to preheat. 2. Unroll the pastry on a lightly floured surface. Using a large sharp knife, cut the pastry into 6 squares and place on 2 large sheets of baking parchment. Score a 0.5cm border around each square. 3. 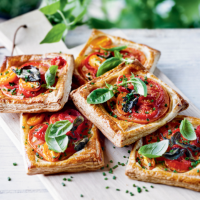 Spread each pastry sheet with ½ tbsp of mustard, slice the tomatoes and layer on top of the pastry. Brush the edges with the egg yolk, scatter over the grated cheese and season with cracked black pepper. Toss the oregano leaves in the garlic oil and scatter over the top of each tart. 4. Slide the tarts on to the preheated baking sheets and bake in the oven for 25 minutes, swapping the trays over halfway through, until the galettes are golden and crisp. Cool slightly before scattering with the chives and basil leaves. Serve warm with some green salad.